The liquid caramel center of this popular flavor is the perfect blend of Smooth Ambler craft bourbon and buttery, golden caramel. 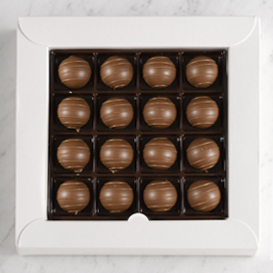 Each piece is enrobed in our smooth, Swiss milk chocolate and hand-decorated with chocolate stripes. 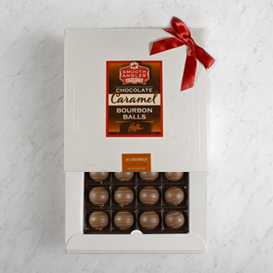 The perfect gift for anyone who appreciates great bourbon and fine chocolates. Ingredients: Swiss Milk Chocolate (Sugar, Cocoa Butter, Whole Milk Powder, Cocoa Mass, Lactose, Skim Milk Powder, Barley Malt Extract, Soy Lecithin, Vanilla), Caramel (Corn Syrup, Sugar, Milk, Fructose, Hydrogenated Coconut Oil, Butter, Mono and Diglycerides, Salt, Soy Lecithin, Vanillin), Cream, Liquor.